This is the ultimate guide to adding the perfect deck! Decks continue to be one of the most popular additions to homes today as more and more homeowners seek to enjoy outdoor living and expand living space. Ultimate Guide: Decks, 5th Edition leads you through the process of designing and building a deck, whether as a do-it-yourself project or when wanting to better understand how to work with a contractor. Inside, you can choose from 30 designs created by master deck builders, with complete plans, materials lists, and hundreds of step-by-step color photographs that highlight the clear, concise, and friendly text. The authors provide helpful advice on generating ideas, selecting materials, and using tools as they lead you through the complete process. Further inspiration comes from dozens of deck designs and ideas from the nation's top deck designers and builders. 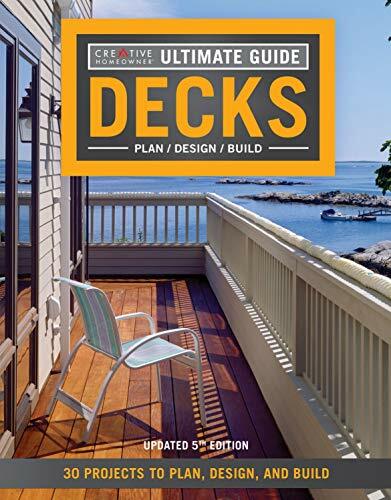 Finally, the 30 deck projects, complete with plans and materials lists, ensure that even a novice can create a finished deck using this complete guide!